The youngest child and only son of the former vice president Al Gore was pulled over for doing 100 on a freeway south of Los Angeles. Cops got to the window and smelled weed so they searched the car. The fuzz did find a small amount of weed but they also found Valium, Xanax, Vicodin, Adderall and Soma. HOLLA! 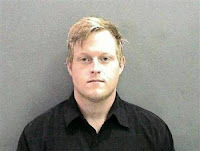 Al Gore III was arrested on suspicion of drug possession and booked into the Inmate Reception Center in Santa Ana, CA about 34 miles south of Los Angeles. Although he quickly identified himself as the son of the former vice president, Gore received no special privileges. Dude, you gotta have a PBA card with a badge number! haha. I guess all this ish doesn't really matter because he was driving a Toyota Prius with its Toyota's Hybrid car so I'm sure his dad will be proud rather than pissed. Had he been driving a Ford Excursion filled with styrofoam cups, I bet then we'd be hearing about it big time from every which way. "Gore's son pulled over in gas guzzling tree killing hate machine", etc. AG3 was released on $20,000 bail. Say word. His dad, the one-time presidential candidate, is one of the organizers of the Live Earth concerts taking place around the world on July 7. The concerts are designed to raise awareness of global warming yawning. Blatant marketing ploy to show that a puss hybrid can do 100+. Haha. Yeah, its no Bugatti... Car and Driver says the Prius takes 39.6 seconds to hit 100mph haha.